IMAGE ABOVE: Orly Genger, Current, 2014. Lobster rope and latex paint. Dimensions variable. Installation view, The Contemporary Austin – Laguna Gloria, Austin. Courtesy the artist. Photograph by Brian Fitzsimmons. Deceptively simple in design, Current, a monumental, interactive sculpture at The Contemporary Austin’s Laguna Gloria estate, intervenes in the landscape to force viewers to consider not only the elements that went into its making, but also the environment in which it resides. The piece is by Brooklyn-based sculptor Orly Genger, who uses lobster rope purchased from East Coast fishermen as her base material. In a labor-intensive process that took the artist and her assistants several months to complete, Genger wove, knotted and crocheted the rope into nets and covered them with latex paint. The artist then stacked and molded the nets into five wave-like forms. Each snakes its way down the south-facing terraced hillside of the Laguna Gloria. One “wave” travels all the way to the end of a small specially constructed dock that extends several feet into Lake Austin, as though linking land to sea. In both its form and content, Genger’s work represents the merger of craft with fine art. But Current is more than just a textile-like sculpture. The fact that Genger constructed it using recycled rope points to trends—or “currents”—in contemporary art that favor repurposing pre-existing materials to create aesthetically satisfying objects without adding to the waste stream. By choosing to work with materials not traditionally associated with high art, Genger creates alliances within the larger social and economic community. 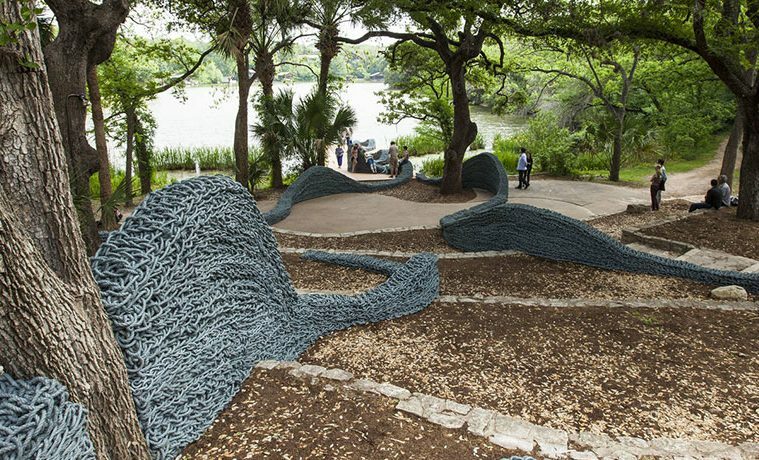 Her choice of lobster rope further suggests that like the fishermen who used it to capture creatures from the sea, she seeks to “capture” the viewers and recreational users of the Laguna Gloria landscape—or at least their attention and curiosity. 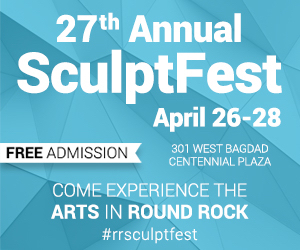 As a structure, Current is kind of environmental performance piece intended to exist in single space for a specific length of time. Its relative ephemerality lends an unexpected poignancy to the installation while linking the artistic endeavor to the cycles of nature. Nothing remains the same; change and renewal are the only constants. 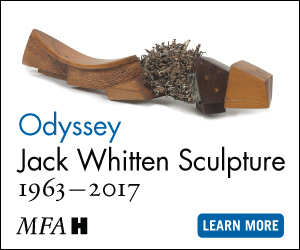 The sculpture’s monochromatic gray-blue appearance is in dramatic contrast to the brightly colored pieces Genger has created in the past. Here the object is not intended to announce its difference from its surroundings and stand apart from its location. Instead, it is meant to harmonize its handcrafted uniqueness with it. As Genger’s forms flow down the hillside, they move over stone retaining walls and weave around the oaks, ash and pecan trees, palms and mountain laurels and traverse pedestrian walkways. They displace three-dimensional space, but in a gentle, Zen-like way that adds to rather than detracts from the tranquil quality of the natural environment. As exuberant as it is profound, Current is an intriguing work. Its implicit invitation to follow its joyful undulations through space engages observers not just with art but with the beauty of the landscape in which it exists.